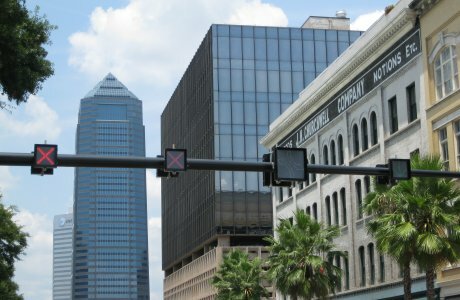 Southern has supplied lane use signals (LUS) for numerous projects across the country including along the Bay Street approach to the stadium where the NFL’s Jacksonville Jaguars play football. Southern’s lane use signs are engineered for low operating costs and many years of service. We offer standard LUS with display sizes of either 18” or 24” and either double rows of LEDs or triple rows. 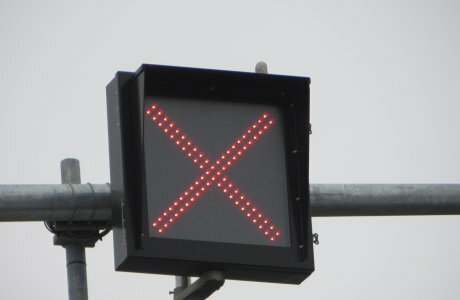 In addition to the standard green down arrow and red X, LUS are available with additional symbols included amber X, left and right amber arrows, and various lane movement symbols. All LUS have internal diming circuits to reduce the intensity at night and glare shields to shade the display from the sun. As with our blank out signs, the LEDs are through mounted into solid-state, conformal coated, printed circuit boards. Circuitry is designed so the display is discernible should an LED fail, and the failure of a single LED does not affect other LEDs. The signs are powered by 120V AC current with internal power supplies for each display that are designed to deliver constant power. The displays and housings meet all federal and state requirements and have passed various vibration and other tests. Please contact a representative for more information about Southern's lane use control signals.